Sandro Chinchaladze is a Georgian musician and producer born in Tbilisi. He has been involved in various genres of electronic music, while playing in several bands. One of the most distinguished projects was a collaboration with Gacha Bakradze and later with Vazha Marr entitled as “MAMM”. Since 2011, with project “Tete noise” he has been experimenting with ambient music. In 2013 his EP, “The Last is The Sweeter” has been released on a German net label “Withering Trees”. Since then, His music has been built with collage-like treatment of field recordings, in noise, aleatoric and other experimental narratives. 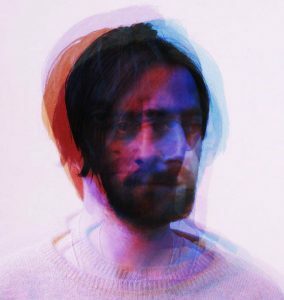 In 2017 he released his ambient albums named “Artificial Frequencies For Daydreamers”, “Alphabet of What We Are” and “Erase Me From The Clusters”. My art is mostly a sound/noise collage which i record in my home studio or Tbilisian streets where I’m born i also gather some noises from all around the world little by little and than trying to use it in my music in way of ambient and experimental music. I don’t have any philosophy, but all my life I’ve dreamt that i can fly, and that I know what it means to fly. In lots of dreams I leave earth. I often dream that I’m in a surrounded by people in tuxedoes, holding drinks in their hands, and I know I could shut them all up in one go. They don’t want me there.Then I’m on tiptoes and I let myself go, I just take off and I end up on the ceiling. And then … I swoop down to the floor and fly up again, and everyone says, “Oh!” Then I turn elegantly at the wall. I dream that the people are all speechless, watching me, a man, fly. Or I dream that I’m flying over mountains. That’s a classic. My Music has shown it from the start. In the studio I close my eyes, I ave my hand on the fader, and I try to form the sounds. I send them through the speakers like a bird flying. That’s not a philosophy, more like primitive dream to make the music fly because I’m flying.